The former HQ of the Coca-Cola corporation at Hammersmith has been renovated and transformed into a unique multi-tenancy office in which tenants get a blank canvas for their own space. PENSON has renovated the former Coca-Cola HQ, in west London, transforming a tired space to a 'punchy' environment in keeping with Hammersmith's dynamic vibe. The building, known as One Queen Caroline Street, is a multi-tenancy building of unique office space. The project rationale was to explore the idea of a blank canvas: creating flexible workspaces that allow the tenants to personalise the space they occupied. PENSON was challenged with spatial problems, such as a small reception area. 'Externally very little could be achieved,' explains Lee Penson, CEO of PENSON. 'The [design] team wanted to create a non-corporate feeling, with a level of cool professionalism'. With two entrances to the building the arrival experience at the building is quite unusual for the UK. With one of the two entrances located in the Broadway Shopping Centre 'it mimics the design of offices in the Middle East that are often within shopping malls', explains Penson. But behind frosted glass lies the reception area, and all sense of the shopping centre is immediately shut out. 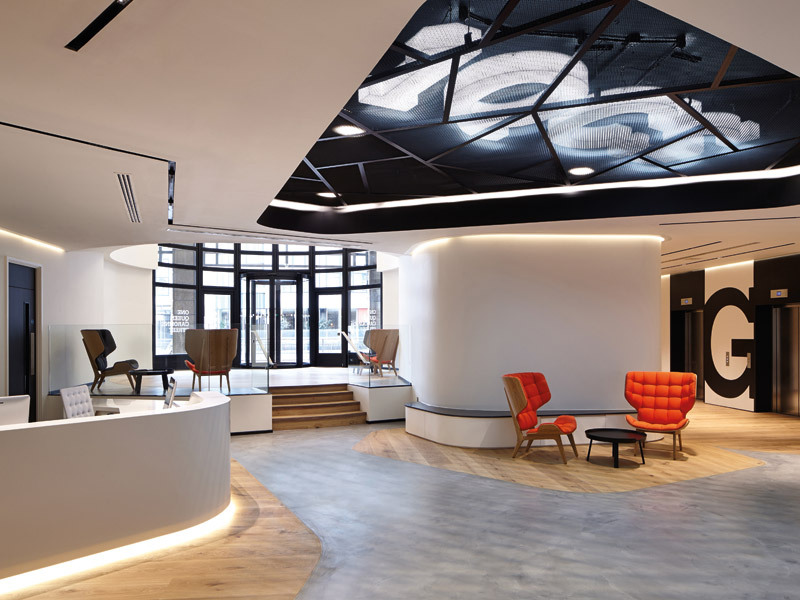 In a circular space opening out at the bottom of a staircase to lead to the reception desks and lifts, PENSON has included a customised lighting feature. The number and letters 1QCS sit against a dark ceiling and for an industrial feel are encased by a false ceiling. In a bright, white and clean space, the wooden floors and Scandi-modern style seating add warmth. A large 'G' graphic by the lifts creates a further contemporary feel to the space. 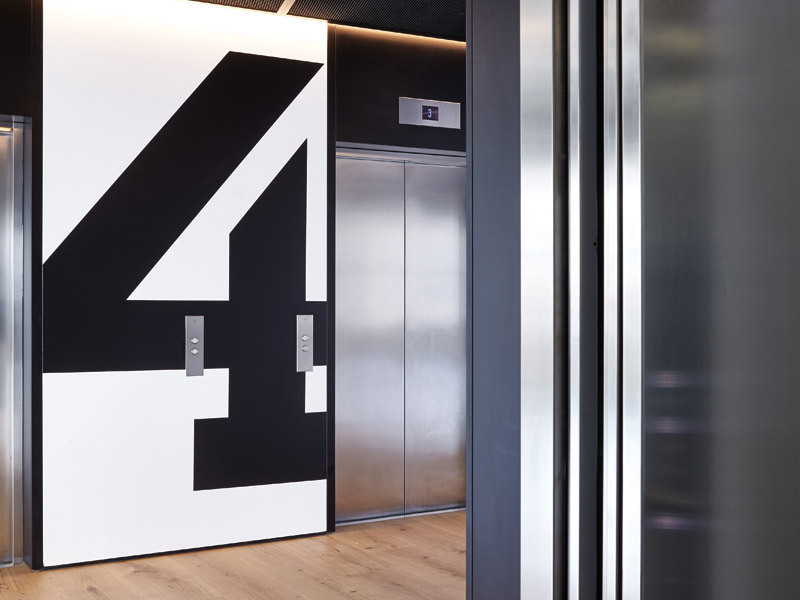 The graphic detail is repeated on each floor level on the lift walls, with the floor level number also featuring as a light feature and inset, as in the reception area. 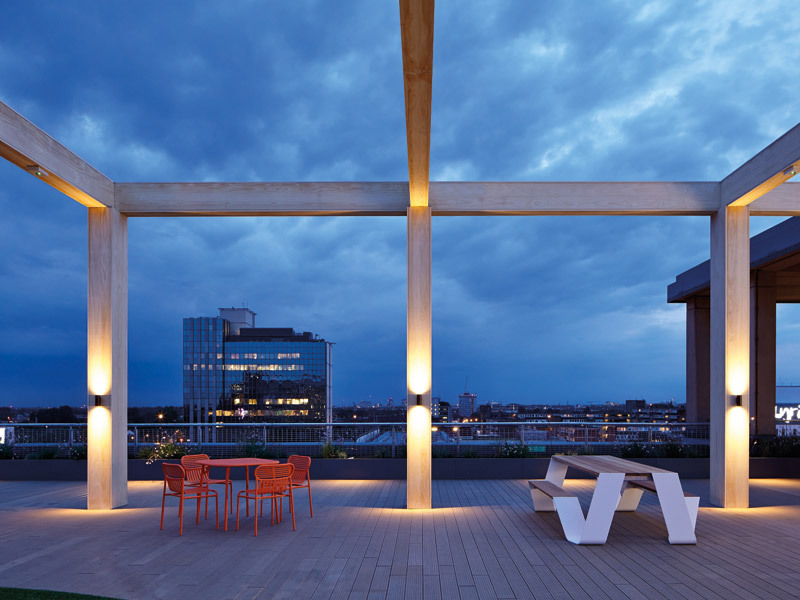 'The office floors are well lit and airy, with services left beautifully exposed,' says Penson. Services work as a design feature in its own right, with would-be tenants making the choice to leave them exposed or to install a ceiling: 'Often new ceilings, walls and floors are stripped-out and thrown into skips. The project avoids this industry-wide model by allowing tenants to personalise their space in any way they like -- from corporate to quirky -- without any waste,' explains Penson. Working to this 'blank canvas' strategy brings a mutual financial benefit to landlord and tenant alike: landlord consents become easier and quicker, and wasting less means 'less abortive costs'. 'Good business is always based on deals that are mutually beneficial, and in the case of 1QCS's strategy, cost efficiencies are shared by both the developer and tenant,' adds Penson. PENSON has also included a new sixth floor, thereby creating both a lettable space and communal roof terrace for tenants.